Farmer Arian Williams is successfully tending 16 acres of avocados in the De Luz area of Temecula, but he and his wife came to the 10th annual UC Pitahaya Festival in August to see whether there is commercial potential in producing pitahaya. 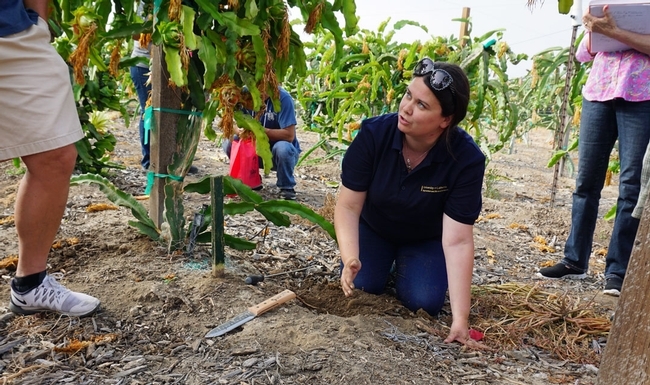 "We're taking cuttings, and trying it now," Williams said. Vanessa Caballero, Williams wife, was enthusiastic about the prospect. "I love the way pitahayas look, and there are not too many grown commercially now," she said. Different varieties of pitahaya produce fruit that is white, pink and deep red. The field day at the UC South Coast Research and Extension Center in Irvine included research-based presentations on irrigation strategies, gopher control, integrated pest management, and the impact of root knot nematode on the vining, climbing pitahaya cacti. Native to Central America, the crop has become popular in Asia and the Middle East. Most of the fruit sold in the U.S. is imported. 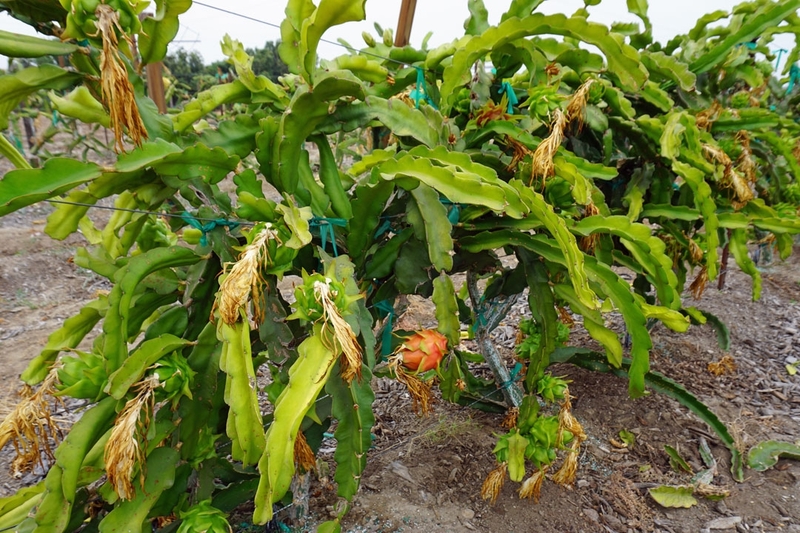 UC Cooperative Extension advisor Ramiro Lobo has found that the unusually beautiful fruiting cactus thrives in Southern California's mild climate. Pitahaya do well in regions where avocados are produced, but use much less water. They can also make excellent landscape plants, adding interest to the garden while producing healthful fruit. 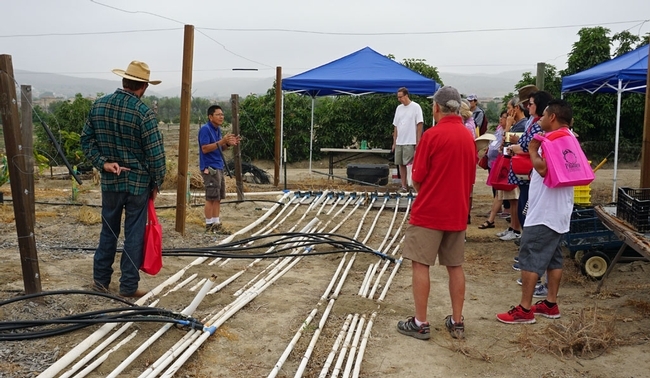 Staff research associate Gary Tanizaki reviews a a pitahaya irrigation trial that includes six different irrigation regimes designed to understand the optimum practices for popular varieties. Pitahaya fruit begin as large, showy, nighttime-blooming flowers, each of which contain male and female parts. In many of the most-desirable varieties, the anthers (the male part with pollen) and the stigma (the female part that needs to be pollinated) are separated by a distance that prevents night-flying pollinators, such as moths, from consistently making the connection. Pitahaya flowers have both male and female parts, however the space between them limits the amount of natural pollination. UCCE advisor Ramiro Lobo recommends growers hand pollinate early in the morning to ensure fruit set. For a uniform and bountiful crop, Lobo suggests hand pollination. Pollen can be collected by shaking a bloom over a bowl or trimming the anthers into a cup with a pair of scissors. He stores pollen in the freezer until the night or early morning hours when cacti bloom. He dabs up pollen with an inexpensive makeup brush and lightly swishes it onto the flowers' stigma. “It's easy and takes just a few seconds per flower," Lobo said. "If you don't hand pollinate, you end up with fruits that are very small. And uniformity isn't there." 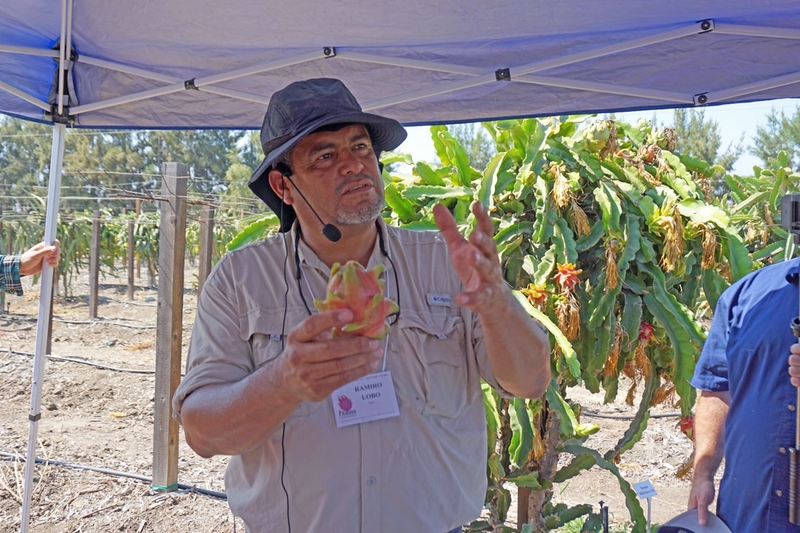 UCCE small farms advisor Ramiro Lobo, the pitahaya research leader, with a sample fruit. 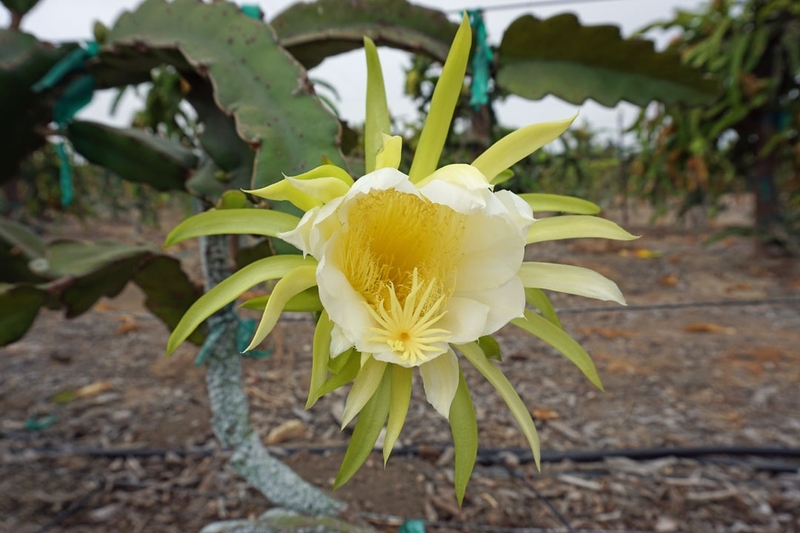 Hand pollination also allows farmers to accurately project their pitahaya harvest and work in advance with fruit marketing companies to sell the crop. Lobo said he carries a mechanical counter to click as he pollinates flowers. Forty days later, that precise number of fruit will be ready for harvest. 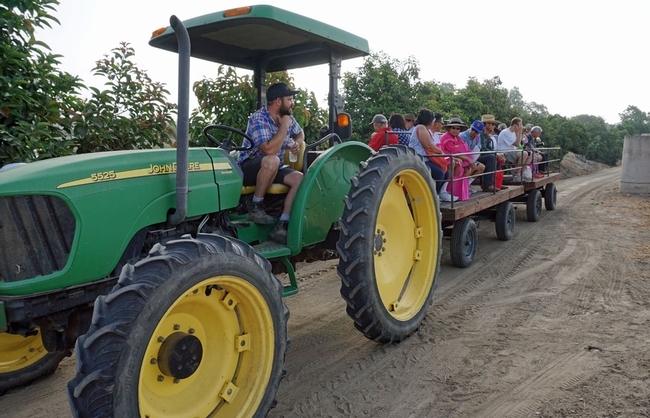 A tractor pulled pitahaya festival participants to research plots at the UC South Coast Research and Extension Center. UCCE urban-wildlife interaction advisor Niamh Quinn demonstrates gopher control techniques. 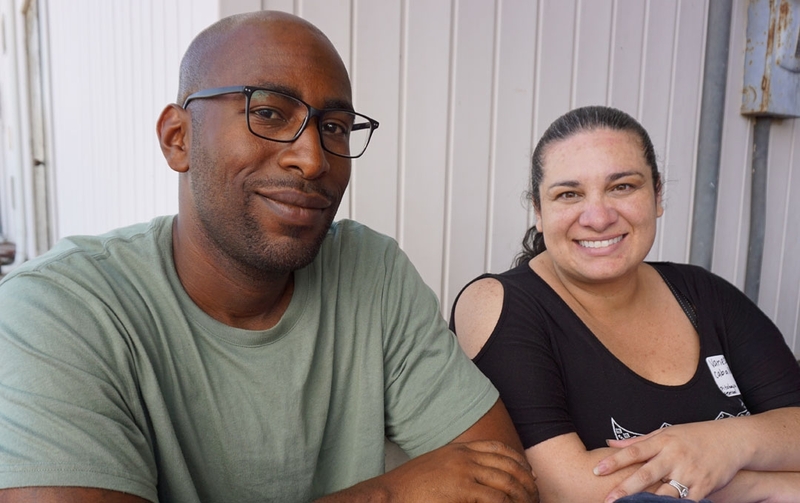 Farmer Arian Williams (left) and his wife Vanessa Caballero are considering adding pitahaya to their 16-acre avocado plantation in Temucula. 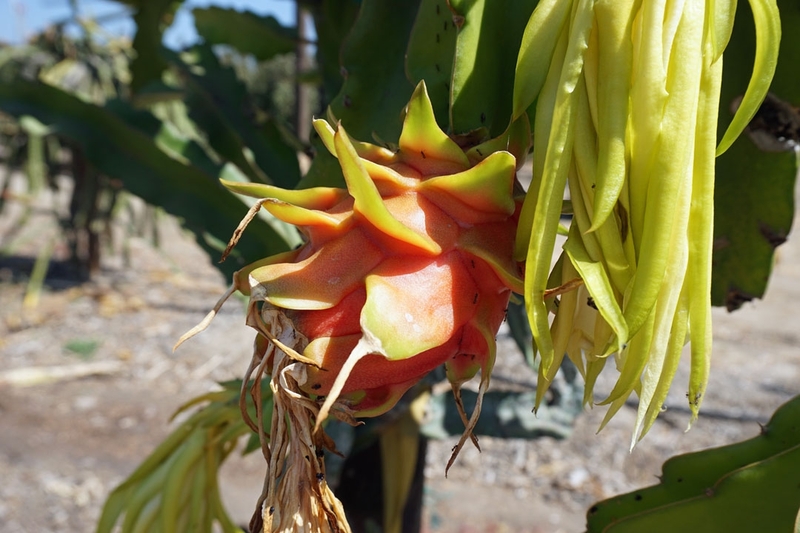 In the U.S., pitahaya are sometimes marketed as 'dragon fruit' because of their spiny exterior and fiery flesh. 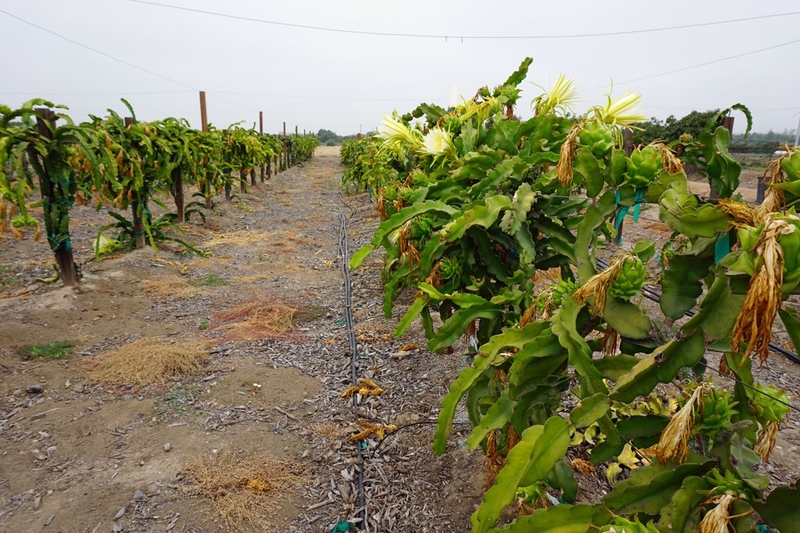 The pitahaya plantation at the UC South Coast Research and Extension Center in Irvine. 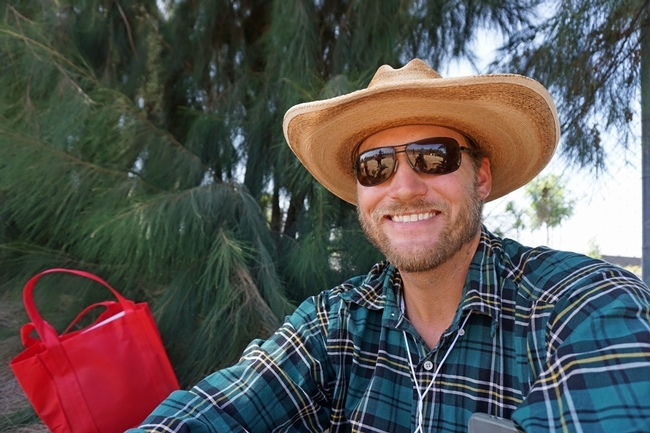 'The Green Cowboy' Chad Morris grows vegetables and manages a farm stand in San Diego. He is experimenting with a few rows of pitahaya. Who knew a fruit could look so crazy! These things are awesome I'd love to try one.